Chamroeun Yann working in the garden with Huggins Center children. Chamroeun Yann (Huggins Center) has been selected as a recipient of the Terri Lynne Lokoff/Children's TYLENOL National Child Care Teacher award. This award acknowledges the critical role of child care teachers in providing quality early care and education. Fifty teachers across the nation receive this award each year. Yann will receive the Child Care Teacher award in May during the Terri Lynne Lokoff Child Care Foundation awards ceremony in Philadelphia. 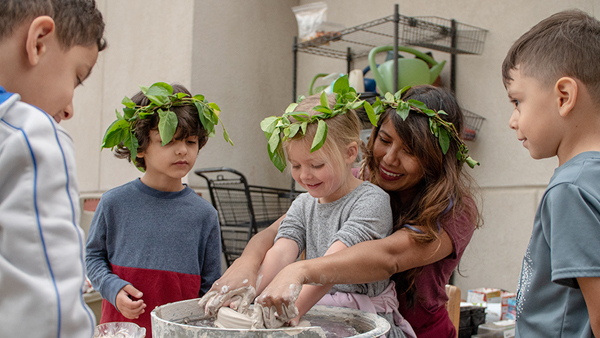 Fresno State Programs for Children is fortunate to have such an outstanding educator whose exceptional work in early education includes the Science, Technology, Engineering, Arts, and Mathematics (STEAM) Garden Cart project. This project offers children, teachers and families the opportunity to integrate technologies into their garden experiences, create a community learning environment and expose healthier eating options. STEAM principles can easily be embedded into gardening experiences, creating a multi-sensory experience for all children. Yann is also in the running to receive the Helene Marks National Child Care Teacher of the Year Award. Her project on STEAM education in gardens has ranked in the top 10 of all projects submitted.